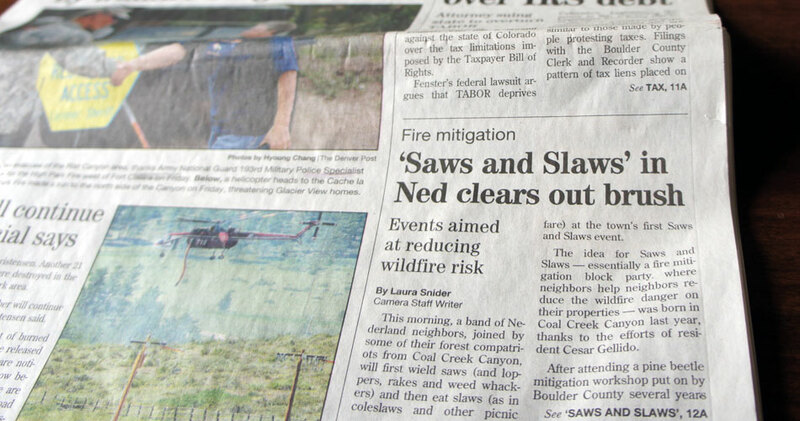 On Saturday morning, a band of Nederland neighbors, joined by some of their forest compatriots from Coal Creek Canyon, will first wield saws (and loppers, rakes and weed whackers) and then eat slaws (as in coleslaws and other picnic fare) at the town’s first Saws and Slaws event. The idea for Saws and Slaws — essentially a fire mitigation block party where neighbors help neighbors reduce the wildfire danger on their properties — was born in Coal Creek Canyon last year, thanks to the efforts of resident Cesar Gellido. After attending a pine beetle mitigation workshop put on by Boulder County several years ago, Gellido got interested in how to reduce the risk of fire in the canyon. County staffers told Gellido that Coal Creek Canyon had a wildfire mitigation plan written for the area, but it needed implementation. “We need to put legs on this plan; we need to put boots on the ground,” Gellido remembers being told. So he did. The result is a program that brings in volunteers to work with landowners on a couple of adjacent properties over one morning to do much-needed mitigation work, which can include raking away pine needles and clearing slash as well as thinning trees. The work usually lasts just for the morning — limiting the possibility that tired sawyers will have an accident — and it’s followed up by a picnic that is meant to build community as well as feed hungry workers. The initiative has been successful enough that the town of Nederland has decided to give the events a try, starting Saturday. Brewer said the board particularly likes the fact that the Saws and Slaws events in Coal Creek Canyon focused on community along with fire mitigation. And while the town is helping organize the events, Brewer said the idea is to support people who want to take the initiative in their own neighborhoods. Those resources, which are being supported by Boulder County, include doing a walkthrough of the land with property owners, helping them decide what needs to be done beforehand and marking the trees and brush that needs to be removed for volunteers. But ideally, the county and the town stay in a support role, Brewer said. “Hopefully, it becomes kind of an organic thing,” Brewer said. Ryan Ludlow, Boulder County’s forestry education and outreach coordinator, said the creation of Saws and Slaws in Nederland is just one of the signs that interest in wildfire mitigation in the mountains is picking up. This spring, the county offered six wildfire mitigation training sessions in mountain communities, which were attended by about 260 people. When the Nederland sort yard opened its doors for eight days over four weekends in late spring, about 1,300 loads of slash and trees were dropped off — about one load for every three minutes the sort yard was open. “I think this has been one of our most successful seasons of outreach to date,” said Ludlow, who was hired almost four years ago to lead outreach for the county’s new forest health initiative for private landowners. The momentum appears to building on itself, as well, as neighbors see neighbors protecting their properties. “They saw an army of slash trucks driving by their houses just full of slash, and that just motivated them to do some work,” Ludlow said. Ludlow says his message in recent training sessions and during one-on-one meetings with landowners is to make it clear that creating effective defensible space around a home can make a big difference in the probability that the house will survive a wildfire. And creating that defensible space — especially in the few feet surrounding the home — can include relatively simple actions, such as cleaning out gutters, cutting down grass and raking away pine needles. “We lost 83 percent of the homes in the (Fourmile Fire) because of the little things,” he said.